Back in the 1980s, the New Republic magazine ran a "most boring headline" contest. The winner was "Worthwhile Canadian Initiative." The title of this post, "Better Batteries," might not have won that contest, but surely it could have placed in the top ten. However, improvements in battery technology matter immensely. Information and technology runs on electricity, and the capabilities of that technology are in many circumstances determined by whether a device can be disconnected from an electrical cord--at least for at time. Advances in consumer electronics (smartphones, tablets, computers, games), industrial electronics (robots), electric cars, and even making more widespread use of intermittent power sources like wind and solar all depend in various ways on the cost and effectiveness of rechargeable batteries. "A new smartwatch has more computing power than the Apollo moon landing spacecraft. Batteries are a different story. Even though consumer electronics makers, from Apple to Samsung, pour millions of research dollars into eking out more battery life for devices, the technology isn't expected to advance much in the next few years. ... Why battery tech has stagnated is a topic of debate among researchers, many of whom claim we're reaching the limits of what science can muster." "There is no Moore’s law for batteries. That is, while the computing power of microchips doubles every 18 months, the capacity of the batteries on which ever more of our gadgets depend exhibits no such exponential growth. In a good year, the capacity of the best batteries in our mobile phones, tablets and notebook computers—and increasingly, in our cars and household gadgets—increases just a few percent." The reason that the battery in your smartphone or laptop lasts longer than it did a decade ago is not primarily because the battery is better, but because of innovations that allow the device to run while drawing less power. The most popular rechargeable batteries in the last couple of decades have been lithium-ion technology. There is lots of research on battery technology, from improvements in lithium-ion to alternatives like supercapacitors. I'm just a casual onlooker to this research effort. But after a few decades of reading short articles and press releases about how this or that approach is sure to revolutionize batteries, I've grown cynical about the prospects for extraordinary order-of-magnitude progress. 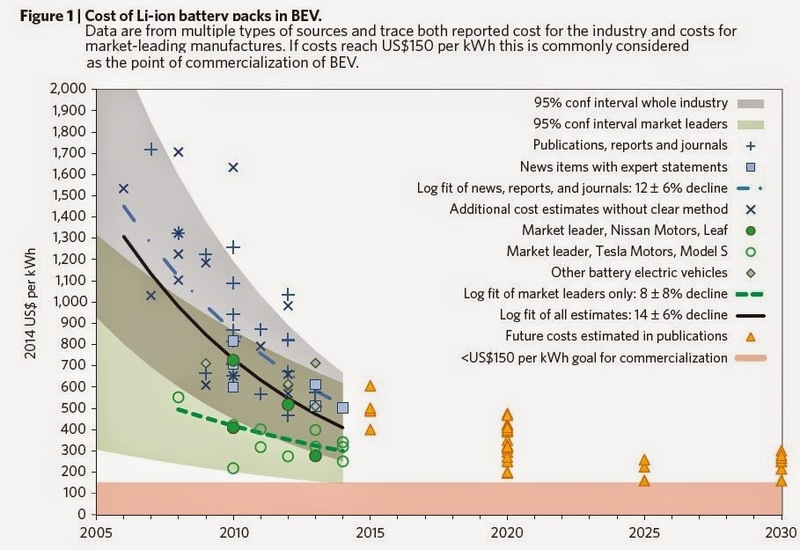 and called "Rapidly falling costs of battery packs for electric vehicles" which appears in Nature Climate Change, published online on March 23, 2015 (v. 5, pp. 329–332). Only the figures from the article are freely available on-line, although readers may be able to get access through a library subscription. For electric cars to be truly cost-competitive with gas-fueled vehicles, battery costs need to drop dramatically. The rule-of-thumb has been that the cost of the battery pack in an electrical car needs to drop to $150 per kilowatt/hour or less. A few years back, it was standard to read that battery packs in electric cars were costing $700 per kilowatt/hour or more. Given the historically slow pace of progress in battery technology, it looked as if achieving these costs savings might be three or four decades away. They argue that the market leaders for electric cars have already reached a cost of $300 per kilowatt-hour--that is, they aren't just writing with another set of predictions for how batteries will improve, but arguing that they have already improved. Further, they note that global sales of battery electric vehicles are doubling annually. This sharp rise in volume seems to me making it worthwhile to push harder on the R&D specifically related to these kinds of batteries, including "anode and cathode materials, separator stability and thickness, and electrolyte composition." They argue that when these factors are combined with efficiencies from economies of scale, annual productivity gains of 12-14% are conceivable in the next few years, although they view 8% annual growth as more likely. On this trajectory, nonsubsidized electric vehicle would be commercially viable in about a decade. If gasoline prices rise again in a sustained way, it could be sooner. Moreover, it seems very likely to me that improvements in batteries for electric cars will at a minimum spill over to robotics applications, and probably to other uses of batteries as well--like the ability to charge your car battery using solar panels or wind power. The usual caveats apply. Past performance is no guarantee of future results. If a battery is charged by electricity generated at a coal-burning or oil-burning generator, the environmental gains may not be large. The materials used to make batteries pose their own environmental risks. But still, it's the best news about better batteries I've seen in awhile. P.S. After this post was published, several regular readers sent along recent articles about new advances in battery technology. For example, Stanford researchers recently announced an aluminum-ion battery. Here's a newspaper article mentioning the aluminium battery, along with research on nanotube-based batteries, sulfur-based batteries, metal-air batteries, and solid-state batteries. Maybe some of these will pan out. But as mentioned in the post, I've been following battery technology in a loose way since the 1980s, and there has been a steady stream of announcements like these that, for one reason or another, turned out not to be commercially viable in the short-term or medium-term. Maybe this time will be different?